One reaction that always troubles students taking organic chemistry is the Diels-Alder reaction. In this article, we will discuss the basics of the reaction and give you a preview of the clear-cut examples of organic chemistry reaction mechanisms available to StudyOrgo members! The Diels-Alder reaction is referred to as a pericyclic reaction, in that two reactants cyclize to become one ring. The reaction utilizes a [4+2] cycloaddition electron mechanism; meaning that the first reactant has 4 pi-electrons and the second reactant has 2 pi-electrons. These are named the diene (2 alkenes, or 4 pi-electrons) and the dieneophile (1 alkene, or 2 pi-electrons, that “seeks” the diene). The diene MUST be in the cis- conformation in order to cyclize, the trans- isoform would not form the ring… try it with your models or on paper! Below is the reaction mechanism using arrow-pushing. This mechanism occurs in a concerted, or one-step, process. It is thought that the dienophile attacks the diene and rearranges the electron distribution to form the two new red C-C bonds and results in a new 2 pi-electron bond. Energetically, breaking 3 pi-bonds in the reactants and formation of the 2 sigma-bonds + 1 pi-bond in the product has a negative enthalpy value (deltaH), therefore the reaction is exothermic and spontaneous! Most examples students encounter are more complex, where the dieneophile has substituents and the diene is already cyclized, thus forming a bridged product. Depending on the orientation of the dienophile with respect to the diene, two products are possible. Below is an example of such a reaction. In this example, only one product is observed; the endo- product. The selectivity for this reaction can be illustrated in the following diagram. 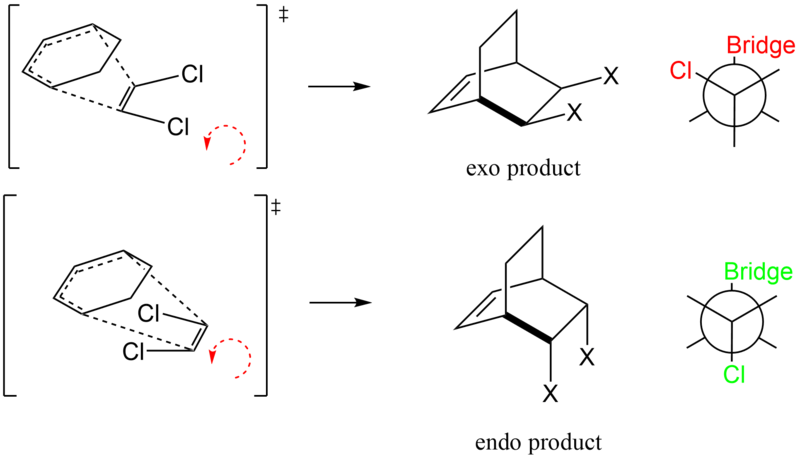 The addition of the reaction occurs via the “left-handed rule” that is, if you put your left hand thumb along the dieneophile and twist to the left (see red arrows), the rotation of the dienophile represents the stereochemistry of the substituents after the reaction is complete. Two products are possible, the exo- and endo- products. The reason endo- is preferred can be seen by looking at the Neumann Projection along the bolded bond. In the exo- product, the Cl group is gauche to the Bridge group. In the endo- product, the CL group is anti to the Bridge group. Thus, steric hindrance is a major factor in determining the stereochemistry and since all reaction will deal with these steric factors, endo- will always be preferred! 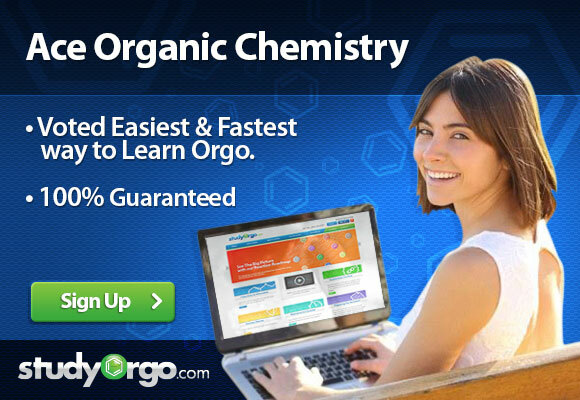 Sign up today at StudyOrgo for more details and examples to improve your organic chemistry grade!